GIW offers training for your on-site pump maintenance team. GEORGIA – When selecting a technical service partner, it can be tempting to rush and choose the first company that turns up — or skip the partnership altogether and keep services in-house. However, in addition to salary and benefits expenses for in-house service technicians, hasty decisions can lead to costly mistakes. From improper pump installations and start-ups to part malfunctions and unnecessary shutdowns, a lot can go wrong. Look at more than just your pumps. Because your pumps are a part of a unique slurry system, your service techs must install and maintain them in accordance with your application and environment — not just to the pump specifications. Bring installation and start-up support as well as on-site training. Technology, parts, and maintenance methods change with new research and products. 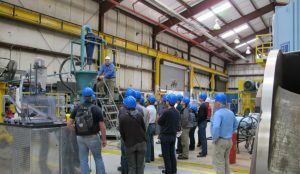 You need a slurry pump service provider who can apply the latest techniques to get you up and running successfully — and then share those tools with your on-site team. Provide 24/7 breakdown service.You can’t always predict a failure. So, whether it’s the middle of the day or the middle of the night, ensure you’re covered by finding a service provider you can rely on. Fulfill warranty claims.If something goes wrong, you need to trust your provider to make it right — quickly and hassle-free. Your service partner should not be one to over promise and under deliver. Prove their dedication to continuing education.Knowledge is only valuable when shared. Make sure your service provider is not just developing cutting-edge slurry advancements but is also willing and able to teach your maintenance team. Offer local service & OEM parts.Your pumps are on-site — and your technicians should be too. Don’t poison your pump with pirated parts. Deal with OEM’s and not re-engineering companies who have no investment in research and development. You need someone whose goal is to provide continuous improvements to your process. Perform alignments and analyses.A “set it and forget it” attitude won’t cut it when it comes to starting up and maintaining slurry pumps and systems. Work with someone who takes a proactive hands-on approach to your slurry system, fine tuning your pump until it’s running at maximum efficiency. Show you they’re always working toward the next improvement. Today’s system operators are faced with increasingly tighter budgets and greater production demands in challenging conditions. Partner with someone who is part of the solution, developing new ways to help you pump more slurry, use fewer resources, and extend time between shutdowns. Have a first-hand understanding of your specific industry.Look for someone with a rich history and strong reputation with others in your market. Commit to being a part of your business for the long haul.Some providers are available just for the “quick fixes.” They will gladly sell you a replacement part, but they’re not invested in your future success. Instead, opt for a long term partner who values your business model and your bottom line. When your technical service partnerships run smoothly, your entire operation benefits. GIW prides itself on maintaining these technical service partnerships and enhancing them through the items on this list — and more. Research, education, industry leading advancements, and reliable, adaptable customer service are all GIW hallmarks. With 126-plus years of experience delivering unbeatable slurry pump and system service to our customers, many of whom have been with us for decades, GIW is there to make your slurry pumping process a success. Please visit www.KSB.com. PUMPS: Why do slurry pumps wear quickly at low flow rates?